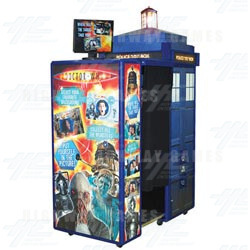 A Doctor Who themed photo booth. Players step inside the TARDIS and get their photo taken with the time lord himself. Customers can select their favourite background featuring the likes of the Daleks, Cybermen, Judoon and more. Four photographs are taken, with the customer selecting their favorite to print. The printing process itself only takes a total of 15 seconds.